The new XF is lighter, cleaner and roomier than ever before, but will that be enough to defeat the BMW 5 Series and Audi A6? Paul Bond tests it on road and track to find out. 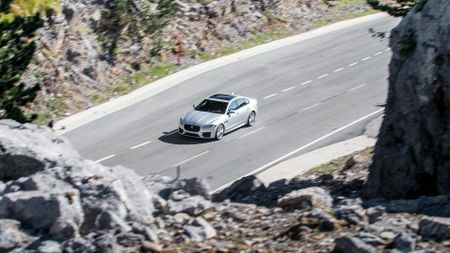 Beautiful, dynamically engaging and efficient enough to justify to yourself and your bank manager, the new XF certainly has a lot going for it. 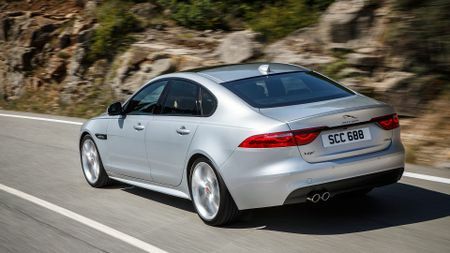 With a bigger boot and less cramped rear seats than the XE, we’d also argue that the XF is the pick of Jaguar’s pair of sleek new saloons. Strong resale values, low insurance groups and generous kit all play their part in making this one of the best execs around, and perhaps even a new class leader. How times have changed. 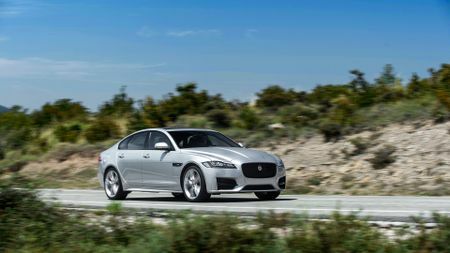 When Jaguar launched the XF in 2007 it was staring into the financial precipice – the future hinged on its success, and the company couldn’t afford to fail. 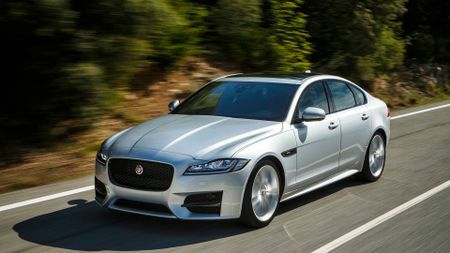 Since then, the story of Jaguar has read like a fairytale, each new model lauded for its style and dynamic flair, multiple awards won, and (in-part thanks to Land Rover) the company is awash with cash, ready to return to the large executive saloon market where it all began. So what of the new XF? With its baby brother the XE stealing the limelight this year, there was a danger that this car would feel like a footnote, but if anything it looks even better than its new sibling in the metal. Designer Ian Callum told us the design is ‘more of an evolution than a revolution’, but the longer we spent with it, the more we admired those clean cut lines, lovely details and strong profile; it just somehow looks right from every angle. However, there is some visual trickery at work, because it’s also shrunk in size. The whole car is lower to the ground, the bonnet is shorter and lower, and the XF is in fact shorter, too. Still, given the importance of the Chinese market, the wheelbase has grown by a massive 51mm, drastically increasing the amount of space available for those choosing to travel in the back. Here in the UK we’ll get four engines to choose from – a pair of 2.0-litre diesel ‘Ingenium’ engines now familiar from the XE and Land Rover Discovery Sport, available in either 161bhp or 178bhp guises. Joining the efficient fleet models are a pair of V6s. 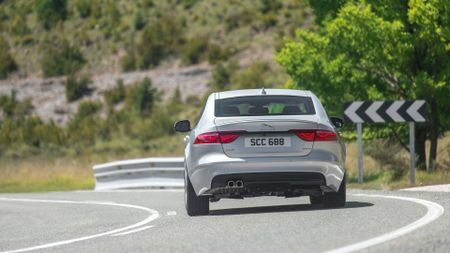 One is an uprated diesel with 296bhp, the other is the same howling 376bhp supercharged petrol from the F-Type S.
Jaguar had clear targets when developing the XF: a more mature driving experience than the XE, with the focus on comfort and refinement, but also building the best-handling big saloon. Let’s start with addressing the latter point. With so much shared technology on-board, it’s perhaps no real surprise that the XF has inherited many of the XE’s stellar dynamic abilities. 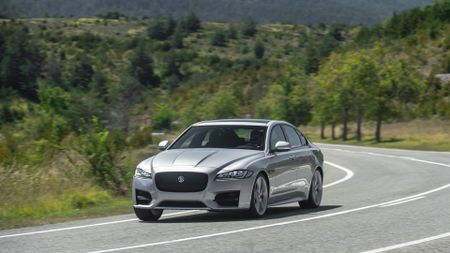 It has the same wonderfully accurate, feelsome and confidence-inspiring steering, but the XF feels less pointy and direct than its little brother, so encourages a more relaxed driving style. 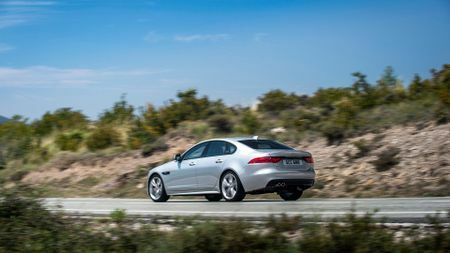 The largely aluminium body means some versions of the XF weigh nearly 200kgs less than before, and overall stiffness has increased by nearly 30 per cent. The stiffer body means there is more leeway to tune the suspension to improve the ride. We tried cars on both a passive ‘Sports’ setup, and the optional adaptive dampers, but both were on the largest 20-inch alloy wheels. In standard guise, these wheels felt like overkill, affecting the low-speed ride and allowing more jitters and jolts from the road to enter the cabin. On the optional setup, the XF does a better job of smothering broken surfaces and crests, but you can feel the body float and check if you hit a series of bumps at speed. Still, both versions feel planted and composed, and there’s a terrific amount of mechanical grip. 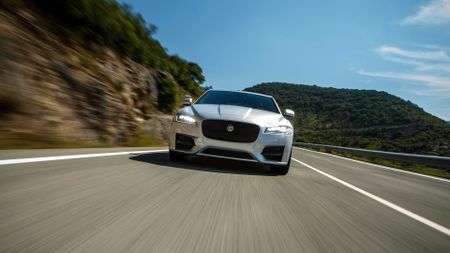 Combine the car’s talented chassis with the wonderfully communicative steering, and it doesn’t take very long for the XF to raise a wide smile on a challenging road. Bravo Jaguar. The engine, though, is not quite such a masterstroke. It has considerable mid-range urgency, and is refined once you get it up to speed. However, at the top end, even the 178bhp version feels a tad breathless. A 0-62mph time of 8.1 seconds is half-a-second slower than the equivalent 5 Series. Part of that is down to the optional ZF eight-speed automatic gearbox, which is not as precise or responsive as it is in the BMW – occasionally pausing on up- and downshifts, and robbing you of throttle response on the exit of tight corners. In cars like these, the interior is just as (if not more) important than how they drive, and for all its exterior desirability, the XF still feels a little compromised in this area. 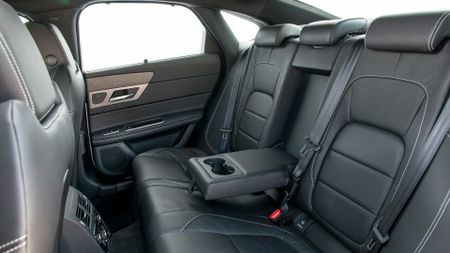 Most of the trim in the car is sturdy and well presented, but there are hard surfaces in your eye line, and it’s not quite as sumptuous a cabin as the current BMW 5 Series or Audi A6. Part of the issue is with space – the BMW feels enormous inside, but the XF is decidedly narrower, and cars with a dark headlining really do feel snug up front, although there is plenty of room in the back. 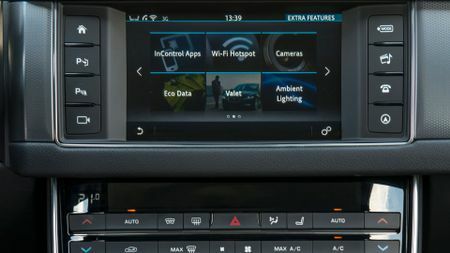 The XF uses the same InControl Touch infotainment system as the XE, with an improved user interface, some nice graphics, and an 8.0-inch touch-screen with sat-nav fitted as standard. It is easier to navigate and quicker than before, but still not as slick or intuitive as the very best. 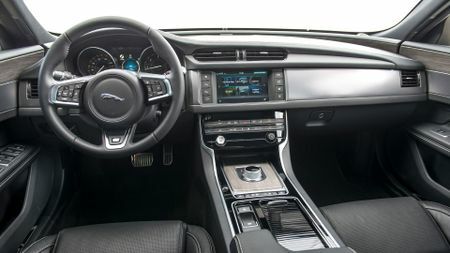 As an option (from December), buyers can upgrade to the InControl Touch Pro, which uses a much faster processor, has a larger 10.2-inch screen and comes paired with a set of 12.3-inch digital dials similar to those on the XJ and S-Class, and can be configured to suit your tastes. We tried a developmental version of the software, but apart from the ease of use, we found the same issues with functionality and operating speed on both. We would save the £1,700 and spend it on something more worthwhile, for example, a long summer holiday abroad. If you’re after a smart-looking executive saloon that’s also a hoot to drive, the new XF should be right at the top of your shopping list. The XE was a leap into the unknown for Jaguar, but the company knows XF buyers well, and has done its homework to make sure this car appeals to your head, too. New servicing packs (one for three years, one for five) have bought the price of the insurance premiums down below all the XF’s major rivals, and it has strong predicted resale values, too. Pile on top of that a fairly generous equipment list, with standard sat-nav, leather upholstery plus heated front seats and dual-zone climate control, but split/fold rear seats are extra. Of the four trims available in the UK, we’d probably stick with the entry-level Prestige, which comes with everything you need, and you can choose to pick out a couple of choice options rather than paying the extra £2,300 for the R-Sport – which adds visual tweaks but little else. Interested in buying a Jaguar XF?